Posted on April 22, 2012	by Judah Gutwein, L.N.H.A. Joe Sanders never expected to wind up in the hospital for an extended stay. At age 68, he was in good health and leading an active life. So when a sudden heart attack on the golf course landed him in an emergency room, he was surprised to learn that his government health benefits weren’t going to see him through the long haul. Unfortunately, like most of us, Joe never took a close look at his government entitlements and other options before an emergency struck. Had he fully understood his choices, he might have been better prepared to cope with the financial demands his care brought about. This article is designed to provide you with the basic information you’ll need to begin assessing your own health care coverage options. Medicare is a two part program underwritten by the U.S Department of Health and Human Services that provides basic hospitalization and medical coverage for people age 65 and over. It also serves people under the age of 65 with certain disabilities. For example, if you have permanent kidney failure that is being treated with Dialysis or a transplant, or have been receiving Social Security or Railroad Retirement disability checks for at least 24 months, you are eligible for Medicare even if you’re under age 65. Medicare Part A provides automatic hospital coverage, as long as you have worked at least 10 years in Medicare-covered employment. It also covers inpatient rehabilitation, sub-acute or skilled nursing care provided in a hospital or long term skilled nursing facility, as well as home health care and Hospice services. Part B helps cover medical and Doctors’ bills, and helps pay for rental or purchase of necessary medical equipment such as prostheses, wheelchairs and post surgical supplies. If you qualify for Medicare and have a non working spouse, he/she can also get Medicare parts A and B at age 65. While part A is yours free of charge, Part B is considered elective coverage and requires monthly contributions. There are also several health care options available to Medicare beneficiaries, which come under the label of Medical Advantage. Most people receive a Medicare enrollment package just prior to their 65 birthday. 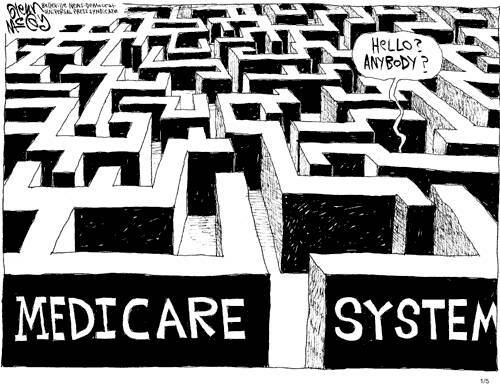 At that point, they may choose whether or not to opt for Medicare Part B benefits and pay the required premiums for that coverage. If you have reached the age of 65 and have NOT received a Medicare Enrollment Package, you must call your local Social Security office in order to determine your eligibility. Introduced in January 2006, Medicare Part D is a prescription drug program available to all Medicare beneficiaries. Most people who qualify will pay reduced or no premiums and deductibles, and lower co-payments for their medication depending on their incomes and circumstances. Since private health insurance companies administer the program, monthly cost and coverage will also vary according to the company and plan you choose, as well as your state of residence. Premiums are in addition to the Part A and/or Part B premiums you may already be paying. Medicaid is a combined federal-state program usually operated by state welfare or health departments and designed to furnish several basic services to low-income individuals. These include inpatient and outpatient hospital care, physicians’ services, nursing home care and laboratory and x-ray services. Under financial hardship, Medicaid may also be used to pay your Medicare premiums, deductibles and co-insurance. MediGap refers to one of several supplemental health insurance policies that can be purchased to cover the costs Medicare often doesn’t cover, like prescription drugs, dental care, orthotics, hearing aids, or eyeglasses. For a complete list of recognized MediGap providers, contact the National Association of Sate Units on Aging, 1-202-898-2578 or visit www.nasua.org to locate the Office on Aging in your state. Long-Term Care Insurance: Planning ahead for sudden continuing health care expenses. Many people mistakenly believe that Medicare covers long-term care expenses such as nursing home and home health services. In fact, the program only pays short-term benefits for care in a skilled nursing facility and for part time skilled nursing visits at home. As for Medicaid, it does not generally pay for long-term care at home or for assisted living. As a result, if a person needs extended, non-nursing home health care, the only solution may rest with his or her ability to pay privately. That’s where long-term care insurance becomes a consideration. Long-term care insurance is designed to pay for sudden, large, continuing healthcare expenses, whether care is provided in a nursing home, hospice, at home or elsewhere. Policies are sold through licensed insurance agents and brokers, and paid for from the policyholders’ private funds. It’s important to note that coverage is not limited to care for the elderly. As such, long-term care insurance may be a consideration for nearly every adult. As you would expect, premiums are significantly higher for older applicants who are at greater risk, therefore, the sooner you evaluate insurance options, the better. Be An Educated Health Care Consumer: What you don’t know CAN hurt you. Understand that most government entitlements are NOT automatic. You need to apply for them and meet all government requirements for coverage. Also, don’t assume that you’ll be covered for everything that comes along or you could be in for an expensive shock. Always familiarize yourself with the details of your medical coverage, and consider filling any gaps with an established supplementary plan. Consult an attorney or government counselor to help you make sense out of complex requirements or limitations in your coverage. This entry was posted in Senior Care and tagged about medicaid, about medicare, medicaid information, medicare defined, medicare information, what is medicaid, what is medicare. Bookmark the permalink.